ok maybe a little melodramatic using jesus' last words to describe what it feels like to complete my first quilt project in just two days, but i am pretty freaking excited. gather round and let me tell you a tale (hang in there through the craft-narrative, or feel free to skip down to the ***) as old as last night's episode of the office (13 hours...trannyclaus, yes!). on wednesday i went and bought the "batting" ($1.31 in the scrap bin) to put in between layers of fabric to make the stocking soft and thick. i also bought "muslin" cloth ($1.49 for a yard) to use as lining. i was intending to make the back the same quilted pattern as the front but i got so giddily frantic as i neared completion that i went lazy and made the back muslin too. being too excited to do things correctly was the theme of this stocking. as things came together on wednesday i was singleminded in my determination to finish. so some things fell by the wayside in my haste and blind focus. 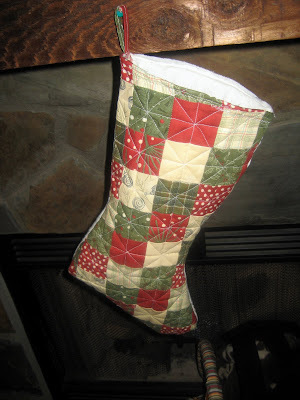 such as only making one seam allowance on the quilt cutout pattern instead of two (one for lining it and then one for putting the lined front and back pieces together) so the finished product is smaller than the template of my stocking that i used. the pieces (minus muslin). 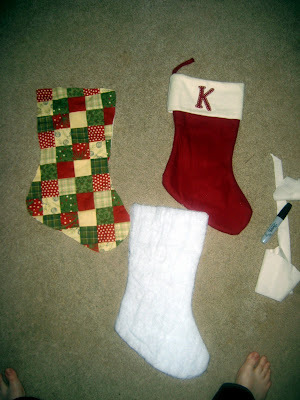 the quilt fabric, batting (padding), and the template of my stocking. one pale stockingless foot free of charge. another thing i failed to realize was that i had been using the same white spool of thread since the inception of this great sewing adventure and it was running out. after i sewed the batting and the lining of the front together i decided to not just leave it as a plain sandwich, but to run some extra lines over the whole she-bang to add texture (this is done with swirlies on real fancy quilts) and to compress the padding. this made me run out of thread way fast. so i had to use a tiny ghetto travel sewing kit spool of off-white that broke every 3 inches to finish the back layer rather than wait a whole 'nother day to buy correct materials and actually do the thing right. (sewing terminology side note: this is on top of the fact that no one anywhere can figure out how to fill the bobbin automatically on this machine so every time it runs out i fill it up by winding it by hand!!! OMG, right, my sew sisters?) so the back layer has half white and half beige thread though i did plan ahead so the beige is invisible on the inside. ahhhh, if only i had paid more attention to the spool here. it was clearly running out while i was blissfully ignorant snapping the photo. God sent the angel Gabriel to Nazareth East Bumbly, a town in Galilee, Georgia to a virgin ahem, chick pledged to be married to a man named Joseph Jesse, a descendant of David Bob. The virgin's ahem, chick’s name was Mary Keight. The angel went to her [sewing machine] and said, "Greetings, you who are highly favored hanging in there! The Lord is with you." Mary Keight was greatly troubled at his words and wondered what kind of greeting this might be. But the angel said to her, "Do not be afraid, Mary Keight, you have found favor with God. You will be with child quilt and give birth stitch to a son stocking, and you are to give him the name Jesus Stockton. He will be great passable and will be called the Son of the Most High firstborn among quilts. The Lord God will give him the throne center of his father David Jesse[‘s mantle] and he will reign hang over the house hearth of Jacob Dukes forever until Judah wants a Transformers stocking instead; his kingdom stitching will never end unravel." "How will this be," Mary Keight asked the angel, "since I am a virgin craft-tard?" The angel answered, "The Holy Spirit will come upon you[r sewing machine], and the power of the Most High will overshadow illuminate you[r thread]. So the holy holey one to be born crafted will be called the Son Sewn of God. For nothing is impossible with God." is it perfect? hell no. there are holes i had to stitch up by hand because i got erratic on the machine and the lines aren't perfectly straight and it's smaller than it should be and the outline is ragged. but hello? i just decided to quilt something last wednesday and ordered the supplies online. they arrived on monday and the whole thing was done wednesday by 9 pm! and you can totally tell what it is. and, bless me, it may even function. 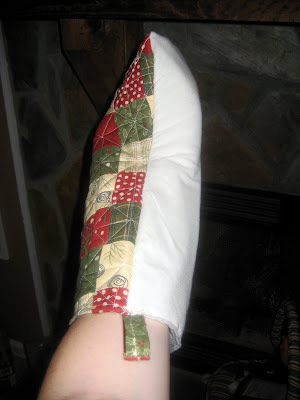 rather than be impressed with myself i have decided to go ahead and be unimpressed by "quilters" instead. if this crap is so easy that a moron like me can do a C minus job in less than 10 hours of work on her first try, it must not be as hard as it looks. what else are the grannies of america trying to trick me into thinking i can't do? geriatric be-yatches of the fayette county joann's craft store, consider this your warning... it's on! OMG. i am lamenting the fact that you have to hand wrap the bobbin. i'm pretty sure that'd make me give up entirely and would probably even make me throw the entire thing against the wall. now if only this post would magically inspire me to figure out my embroidery machine! i wish you lived closer so you could come over with your head lamp and help me!! I don't know if your machine takes a certain kind of bobbin, but you can buy bobbins pre-wound at Joann's....I can never get my bobbin threading to work right and use those a lot. 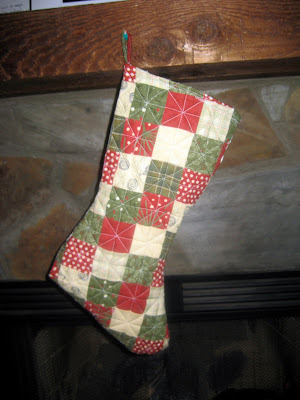 You did a GREAT job on the stocking! 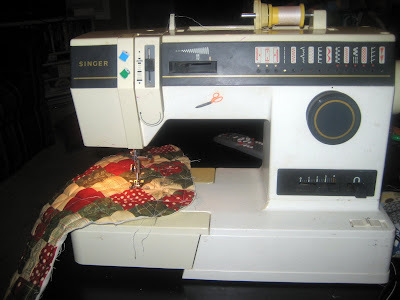 I have sewed a few quilts and am so impressed that you did so well just learning it on your own...it's tricky trying to get everything lined up, but yours looks great! I say you are officially a Patch Blaster now (which makes me think about Math Blaster, the hilarious math computer game of the 80's. Nice) And yes, it's Lacey! I thought that the strike through gospel was hilarious but I didn't know that this little nugget awaited: "if your wrath is self-righteous the points cannot bite ya's"